Rewiewing games is not always an easy thing to do, but when it comes to reviewing Journey 3 years ago, it all felt so natural that it may have been one of the best articles we've ever written. Because we thought it deserved to be brought back to light, and because we're sort of lazy, here it is again to celebrate the release of Jenova Chen's jewel on Playstation 4. We only added a very short paragraph to tell you a few words about the port, and of course a bunch of 1080p/60fps videos because well, after three years, we feel we now can show it without having the impression of spoiling the surprise. That being said, if you have never played the game, please stay away from those vids. Note: The full walkthrough has been sped up so it lasts 10 minutes instead or 90 minutes. A vast desert. Surrounded by a sea of sand, the only barrier between a rather mysterious character and a mountain that rises in the distance is a sea of pristine dunes. The player will use a shiny mountaintop as a beacon to guide them through a mysterious spellbinding odyssey. Similar to the game Dear Esther, Journey allows the player to create his own story by taking on different paths and using magical glyphs that will help you travel. The freedom experienced in the game let’s you interpret what happened before and gives it a very dreamlike appearance. Hovering, that’s the word that will keep coming to the player’s mind. The mysterious traveler gracefully glides over the sand and twirls in the air to reach new heights, which gives the player a heavenly feeling that will never be forgotten. The visuals of this game are stunningly beautiful. While amazed by the landscapes, or overwhelmed by the hostile environments, it will be hard not to be emotional. There is no doubt that anyone will remain insensitive to the splendor of certain environments surrounded by the warmth of the sunlight. Furthermore, this blissful contemplation gets rid of any anxiety and claustrophobia, because of the dream likeness of this game. 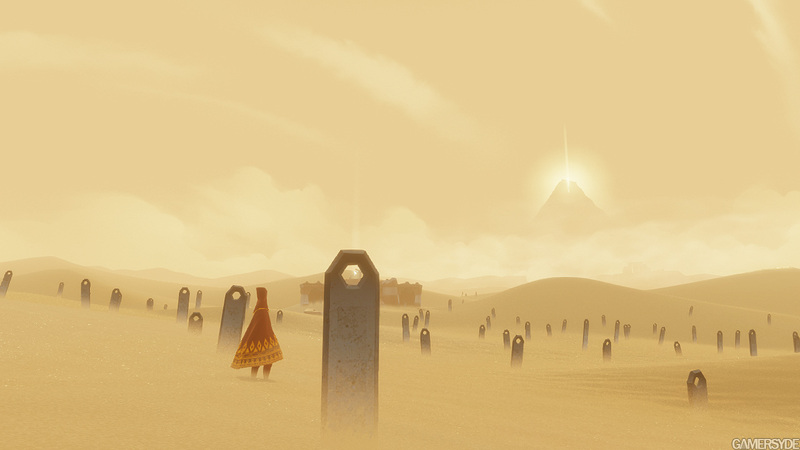 To spare you the details, Journey takes you to a place few games can. If the new creation of ThatgameCompany didn’t offer too complicated gameplay, and limited interactions with the world of Journey, it is clearly not the same kind of experience as in Dear Esther where gameplay was minimal. We actually find similarities in this game comparable to classic games such as Ico and Prince of Persia, especially in the sense where the feeling of loneliness is experienced by the player when he is not accompanied by anyone. Yes, Journey is not an adventure that you take on by yourself. It is actually possible to travel with another player who is on the same quest as you. A spirit with whom you cannot communicate with other than through musical notes triggered by the buttons on the controller. We then share a couple of kilometers across the dunes, sometimes working together, and other times going our separate ways. The moments spent with other players are wordless and therefore never breaks the harmony experienced by the mystery that surrounds us. Who is this stranger who helps by constructing a necessary bridge for the progression of the game? Who is this stranger whom helped travel the icy slopes of the shinning mountain? To find out, we will need to finish the game and during the credits, we will see the names of the players whom we encountered during the game. But before that, we will need to overcome obstacles, avoid traps, and of course travel across the vast desert and be guided by mysterious winds. To do this, we’ll need to collect small pieces of swirling clothes that will charge the traveler’s scarf and allow him to jump higher and hover in the air. Of course, they are hidden from the world, but with the help of mysterious symbols, the player will get the chance to lengthen his magical scarf, which will give him for flexibility with his aerial ballet. Similarly, several hidden areas invite the curious players to explore and get sucked into wandering with the hopes of finding lost ruins after the climb of an endless dune. For those who answer the call, the trip will probably not be unique, not as in one walkthrough but as in one of a kind. We will therefore highlight the first thoughts and experience, with the hopes of a better understanding of this desert world, and also win a few trophies along the way. After all, deflating one’s ego never hurt anyone. Anyways, what kind of crazy person would say no to exploring such a beautiful dessert? Although the game is indeed beautiful, it is nonetheless extremely short. For length of the game, which is about two hours, it deserves to be the price of a good (or bad) DVD. Obviously, this may be debated, but we will let you decide weather the quality of the game reflects the cost of it. Time may have passed, but Journey is still the masterpiece it was back when it was originally released. 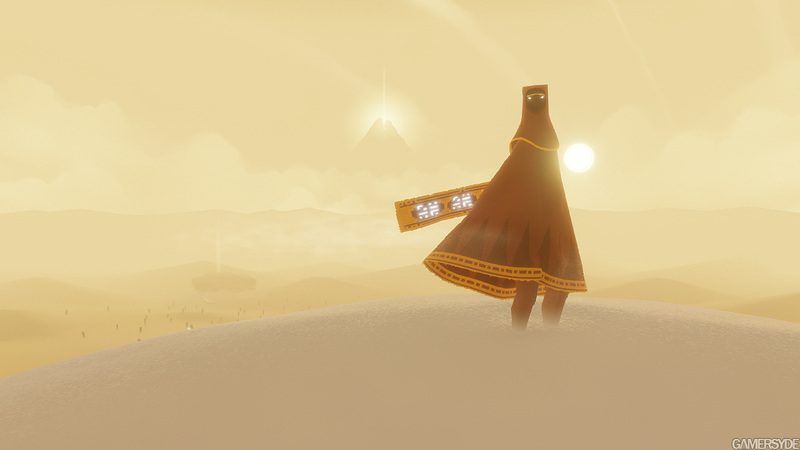 Free for all those who bought the digital version in 2012, Journey is the kind of title you must not miss if you haven't experienced its mesmerizing beauty. The breathtaking landscapes, the friendly strangers you'll encounter on your way to the mountain, the perfectly orchestrated soundtrack, everything that made Journey what it was reaches new heights on PS4. Emotion does not give a damn about the debates gamers love to have when it comes to framerate and resolution, but it has never been as overwhelming as it now is in 1080p/60fps. What better way to pass the torch from one generation to the other, while we are all waiting for the studio's next crown jewel. 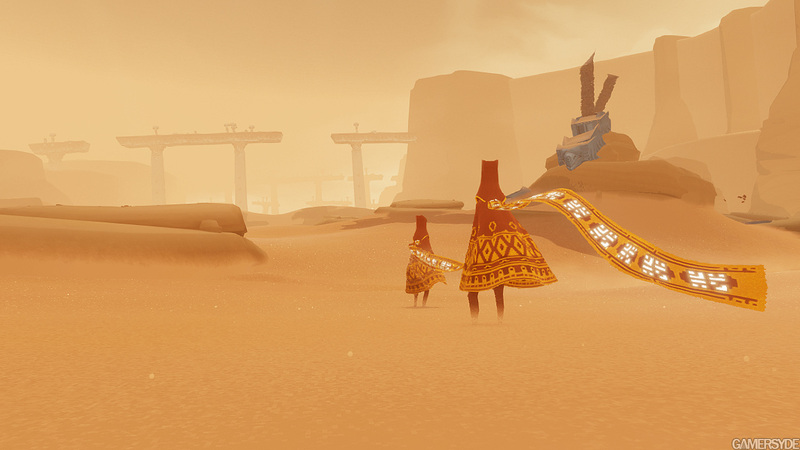 Journey is a strikingly beautiful game; it is a mesmerizing work of art and the music is simply beautiful. Diving into the game is an experience like no other both touching and exhilarating. The only “scratch” at this delicate scarf, is a short lived life for the character you play as, at least for those who refuse to leave for another trip. The reasons for doing it (discovering all the hidden symbols, some buildings, and successful test under certain conditions, etc.) are not sufficient for all. Only you can find the answers to the question: should I accept the invitation to the voyage Baudelaire was talking about in the Flowers of Evil? For us, our bags are already packed and ready to go, and the price of this game won’t change our minds from going on this beautiful journey. 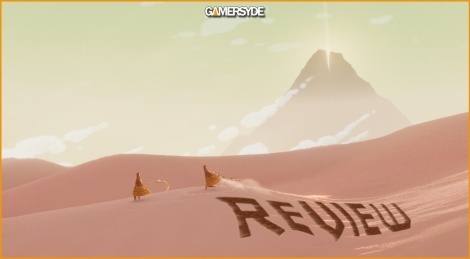 Any word on new thatgamecompany's game? I remember reading something a while ago. I didn't know GS did reviews? I feel bad saying this, as if I'm a little dead inside lol, but I really did not find this game nearly as emotional or beautiful as so many claimed. I played it 90% through co op and just never really got any true sense of wonder. With all the rave reviews maybe I just had too high of expectations but I have no idea how this won game of the year. I thought the music was good, set the atmosphere's well. And the different looking areas were nice to look at. But the journey it's self.. Didn't get any emotional feel to it at all. Didn't feel anything playing through it. And by the end I was like.. what.. that's it? I'd say it was okay but nothing more. I felt very invested emotionally because of all the communication without words, on basic perception level. You could only guess what happened to the old civilization, but somehow got the idea through pictures and ruins and this world. I just felt the sense of wonder to traverse and discover, meeting and parting with strangers along the way, talking to them without words, albeit I was a little disappointed that the journey was linear. But what can you do, otherwise you could miss stuff, and it'd require a lot more resources to produce a content packed open world of this scale. And the music, oh the music. Complimented beautiful levels perfectly. P.S. : "dessert" world? Yum. Beautiful dessert. We have been doing reviews for a long time now, but we mostly stopped doing them in English because no one cared. We still do them in French, and just post the conclusion (and videos) on the English side. One of my favorite :) thanks for review. Well there is a new game by one of the thatgamecompany devs called ABZÛ. It was revealed at E3 2014 and there was an update there about 2 months ago. I play Journey once every year since 2013, every time I can feel something new. Still the same game, but I'm changing.